What am I trying to prove with this? Nothing! Just that working during the summer months can also be very satisfying if you look at it from the right perspective. Making progress while everyone else “sleeps” is a GOOD THING, in my opinion, and if you’re doing the same: congrats and well done! OK, enough of the intro stuff. We have a lot to cover today; I have a lot of numbers and graphics to show you—so let’s get the party started! This month has generated RECORD sales for me on Amazon UK—not counting January, which was even higher. Part of this obviously comes from Prime Week and Prime Day, but even without those, the results would be very solid. Especially if we consider that July is typically the SLOWEST month of the year for many e-commerce businesses (possibly one of the reasons why Amazon does Prime Day in July? Most likely). It is interesting to see that when Prime Day was over, there was a very sharp decline in sales. Then, the following week, things started to improve again. By the last few days of July, sales have come back to normal levels and are even exceeding them. All in all, July was a great month and—even without the Prime Day boost—it looks like it would have performed plus/minus as usual. So, it’s a NET profit number after all the expenses/costs. 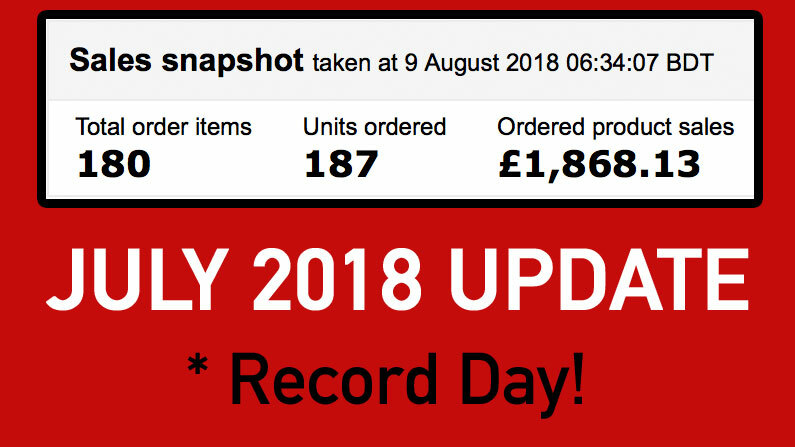 I would be VERY happy with the £8,412 profit number in July, as it’s one step closer to my target profit for this business, which is £10k per month. Still, since this business is very new (not even one year old) and I’m only selling on Amazon UK, I know there’s lots of potential and room for growth, so I’m just looking forward to doing more and doing even better! Remember, that £8,412 is not my final profit because I’m spending money on ads too. In July, Amazon switched over to a new dashboard for ads! I actually spotted that they were testing this new dashboard a few weeks ago, but it was NOT showing the right numbers at all and they probably switched back to the old interface until all the bugs were sorted out. In terms of ACoS, I have managed to stay around that magic 40% mark, which is my break-even point too. This means that I’m not making any profit directly on ad sales (probably losing some), but as I have explained in my previous posts, this is how you have to play in competitive markets. You spend money on ads to maintain sales velocity and high organic rankings, which is where the profit comes from. The biggest problem for me—as an entrepreneur and someone who is always looking to do more and do better—is seeing that sales are pretty much stagnant throughout the first year of trading. 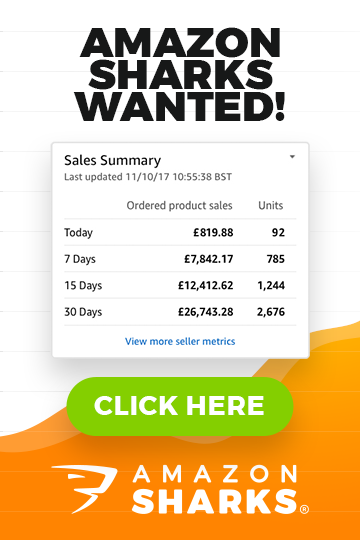 They are in the £15k to £20k range per month and, to be completely honest, I can’t see how I could double that number on the Amazon UK marketplace alone. 2) I changed the price from $12.99 to $9.99, just to see if it makes any difference in conversion rates and future plans. It turns out that stopping ads DID NOT stop my sales completely! Quite the opposite; sales continued to come in, even though it was at a lower rate. I was finally making a profit WITHOUT spending a dime on ads! 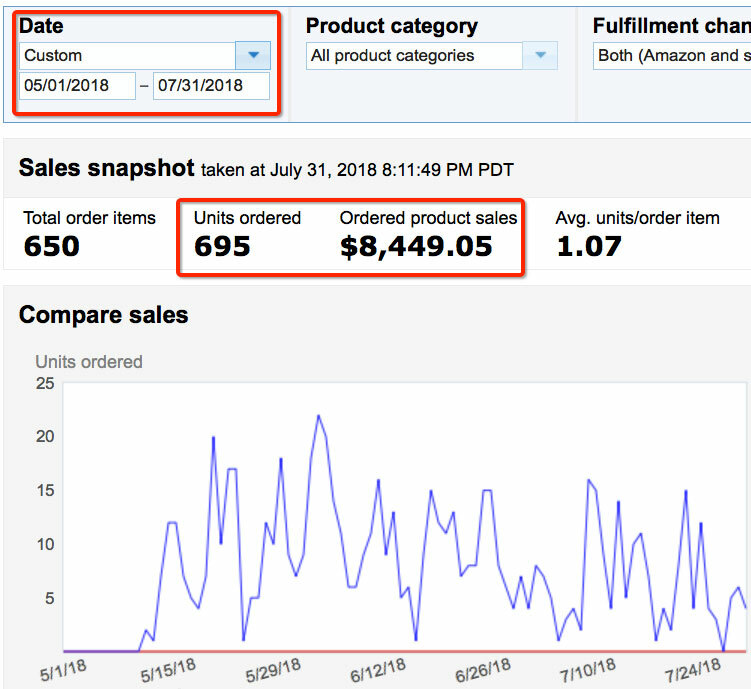 In June, I sold 314 units but spent $2,129.84 on ads. 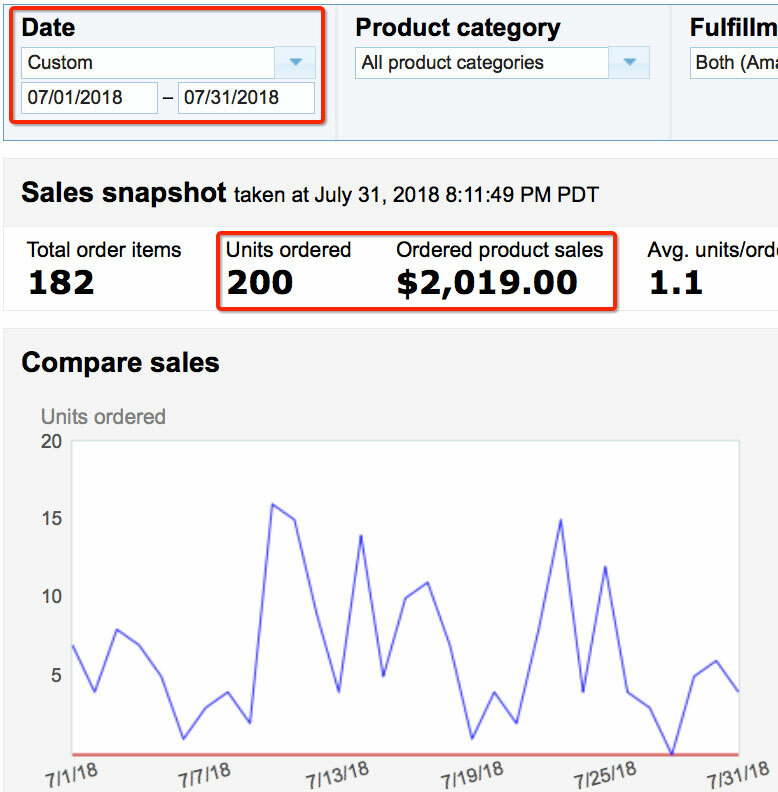 In contrast, in July, I sold 200 units but did not spend anything on ads. Slightly fewer sales—but that’s still a lot of money saved and 200 units still sold! This just proves my theory that using the aggressive PPC ad campaign on this product in this niche won’t work (due to the price/variations/competition I explained in last month’s update). As you can see in the report, there was even a day when I made 15 sales and more than a few days where I made 10+ sales! If it would average out at even 10 sales per day through the month, I would actually be very happy because it would mean I’m making $1000 PROFIT without spending anything on ads. I also saw that I’m already ranking on page one for some good secondary keywords. While this is most likely due to the sales velocity I created by spending money on ads in first two months, it doesn’t change the fact that, as painful as the launch was, the product has started ranking and does create organic sales. Steady organic sales. If we look at the exact numbers, I sold a total of 200 units in July, which resulted in total sales of $2,019.00. Product cost, including shipping to the US, is $2 per unit. Which is not a lot, if you ask me. What is $3, right? But it’s still a 33% margin, which is lower than my own preference (40%+). Remember, though, that I made this price change as an experiment to see how it affects my sales conversion rates. One thing is for sure: after seeing how expensive clicks are in this niche, it is simply impossible to make PPC cost effective when you’re making just $3.30 in profit per item—IMPOSSIBLE! Sure, I could put in 1000 keywords, bid very low, scrape together some low volume, cheap keyword traffic, but I would not get any profitable, major keywords when I have to pay $2 or $3 per click. Anyways, I sold 200 units. When that is multiplied by $3.30, it means I made a NET profit of $660 as I did not spend any money on Sponsored Products ads. Which means that I have finally made a REAL net profit! My $600 profit in July minus the $391.02 losses in the previous two months = net profit of $208.98 ($600 – $391.02). Of course, $200 is nothing and not the result I was hoping for. So, for that reason, I’m making a BIG change to my USA expansion plan, which we’ll cover in a second. Before that, I wanted to quickly cover the results of my conversion rates experiment. When we look at listing conversion rates, we always have to keep in mind that the conversion rate alone is NOT a metric to base your business decisions on. What matters is how much money you make, right? You could sell a product at half the price of the competition, get crazy high conversion rates and still make a very small profit. Or you could increase the price, have fewer units sold but still make a solid profit. I’m sure that I don’t have to point out which of these two scenarios you want to go for. But to know which one works best for you, you have to TEST the price point of your products on Amazon, so that’s exactly what I did. I changed my price from $12.99 to $9.99 because my price point was not level with competition (at least that’s how it looked), and I wanted to see if it would make any major difference if I lowered the price. My profit per unit sold at $12.99 was $5.85. With the new price of $9.99, that profit number went down to just $3.30. So yes, it’s a MASSIVE difference in my margin, and this is how it will always be with cheap FBA products. We pay a fixed amount for FBA fees and seller fees won’t make much of a difference, so EVERY dollar in price change directly affects our bottom line. As you can see, it is actually MORE PROFITABLE for me to sell FEWER units at the higher price because my net profit at the end of the day is 25% HIGHER! Every 100 visitors that land on my listing would net me $50 more when selling the product at the higher price of $12.99 instead of my current price, which I have set at $9.99. So, will I change the price back to $12.99? Not yet…. First of all, 100 sales may not be enough to make a statistically sound decision here. I would like to see 300 sales or so before taking these numbers for granted. Secondly, as you can see with the lowered price, for some reason, I have lost some Buy Box time. It now stands at 86% compared to 99%, which I found weird to be honest! A better price, a better conversion rate, but I lost some Buy Box time? Hard to explain that. Maybe it happened because I don’t run ads anymore? I’m not sure, but I’ll monitor the situation throughout August and report back in next month’s update post. Lastly, the 34% conversion rate I got in June was when I was also running PPC ads! From my experience, I can tell that conversion rates on ads are generally lower on average than what we get from organic rankings. Could this mean that the actual conversion rate when selling the item @ $12.99 was closer to 40%? Maybe. It’s hard to say, but if that’s the case, it was NOT worth lowering the price to $9.99 as the conversion rate did not change that dramatically and, actually, I was already getting a very good conversion rate at $12.99, despite the fact that it was the most expensive version of the product on the marketplace. 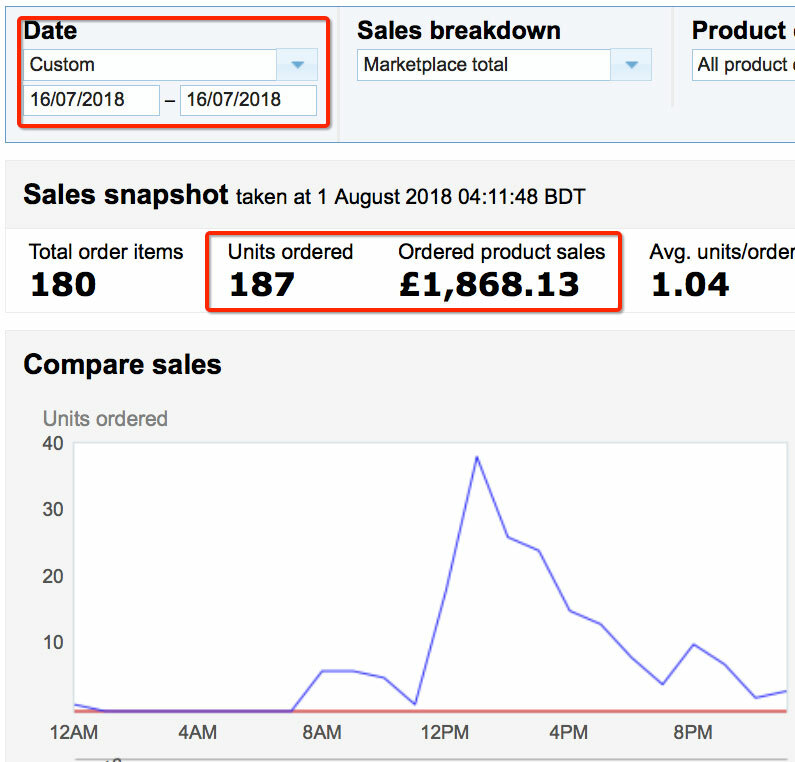 What I can also clearly see from the screen is that one variation of the product I’m selling is a clear winner and outperforms every other in terms of sales and conversion rate. This makes me believe that there could still be a chance for me to make this work. Conversion rate of 44% is truly IMPRESSIVE and shows that people LIKE that particular product variation a lot! I will continue monitoring the situation, but I don’t put much hope into this…. That doesn’t mean I have given up completely on the Amazon US market for this niche! What I have is a Plan B—or let’s call it a second attempt to launch a successful product on the Amazon US marketplace in this niche! So, what is this Plan B? I’m going to create a new version of the product—a bigger and more expensive version. In previous posts, I explained that the competition in this niche is massive on the Amazon USA platform. Not only are most sellers selling the product cheaper than I am, they are also selling bundles that contain “more of the product” than what I currently offer. So, my idea is this: I will create a new bundle that combines three variations that I currently sell at $9.99 each, and I will sell them together for $24.99 (most likely). So, basically, I’m going super-sized and hoping that it will “stick”! This new pack and price point will leave me with roughly a $10 margin to work with, which “should” be enough to cover PPC costs—but it’s all theory at this stage, of course. I will never know how well the product will convert and how well it will rank before I try it. So, I’m willing to give it a try. I will continue updating you on my progress and I’ll share the success or failure along the way. Right now, I need to start working on the new packaging for this new bundle. The product itself will basically stay the same; I just need a new custom packaging to create this new, bigger, improved bundle. I will probably do a separate blog post on custom packaging in August or September since that’s one of the topics I get asked a lot of questions about. The plan is to sort out the packaging during the month of August, then work on the listing, images and descriptions in September. Hopefully, I will start selling the bundle in early October, right before the holiday season kicks in. And I will document it all! I will write about every step of the process starting from keyword research, writing listing titles and descriptions, and taking amazing product images! All of that will be covered in my blog in the upcoming months! If you want to stay updated on my latest posts, you can sign up to my free newsletter! All you have to do is enter your email address in the FREE VIDEO opt-in form at the top of this page (or my blog’s homepage). Every week, when I publish a new post, you will receive an email from me. 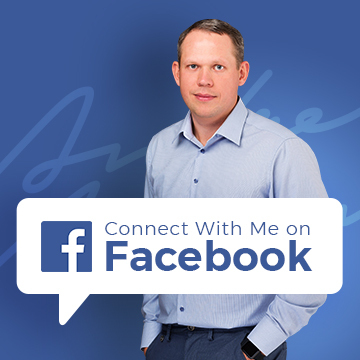 Alternatively, you can follow me on Facebook, Twitter, Google+ or LinkedIn and get updates from me there as well. Lastly, if you have any questions about anything I have covered in this post OR you want to share your own experience, feel free to leave your thoughts in the comments box below. I personally reply to all comments within 24 hours, Monday – Friday. I currently sell an electrical product that is doing very well. However, I want to add different variations of the product – it is exactly the same, just different colours. Am I best creating a brand new listing, or adding it to the listing as a variation? I am worried that if I add it to the existing listing, wont it effect my ranking and BSR? I have since lots of posts on forums saying that adding a variation can harm your existing listings BSR and rankings if it does not sell as well! which of course is a possibility. Keen to understand your thoughts as I know you mentioned you have sold variations/added variations to your listings. If it’s ONLY the colour, I would add it as a variation as it only makes sense from the customer perspective. BUT don’t forget that on Amazon each variation gets their own listing anyways so people will be able to find them in search and you can even advertise them – the variation situation on Amazon is only created with parent/child listing connection and I can’t see how that can affect your BSRs? The only way it can affect BSR is that people will select other colours too, which will bring BSR down for existing listing a bit BUT you will get of course more sales in because of more choice for customers. Another thing to consider is competition levels – if it’s not bad and you can easily get ranked and get clicks to new listings in your niche, then it would make sense to have separate listings for each colour. But if that’s not the case, you will probably struggle to get them all ranked and advertised cost effectively. I had been advised that it harms the listing due to BSR changes of the whole listing, it is indeed a bit tricky process, especially depending on the time when you add new variations. I’m not sure anybody know the exact answer, and different sellers since to have had different experiences… perhaps best to slow integrate variations once a listing is established, by advertising it independently using PPC? Yes, as I said – it can harm BSR for your current ONE variation as some percentage of people will pick other colours/listings and that dilutes the sales velocity across all variations. I would probably in your place try launching one or two new versions as separate listings and see whatever you can market/rank them effectively. If that doesn’t work, then try adding them as variations. In my experience CurrencyFair are far better than TransferWise. In what way “far better”? Phenomenal results Andrew, congratulations and well earned. Your posts are always so informative and rich in context, I am very grateful for your posts. 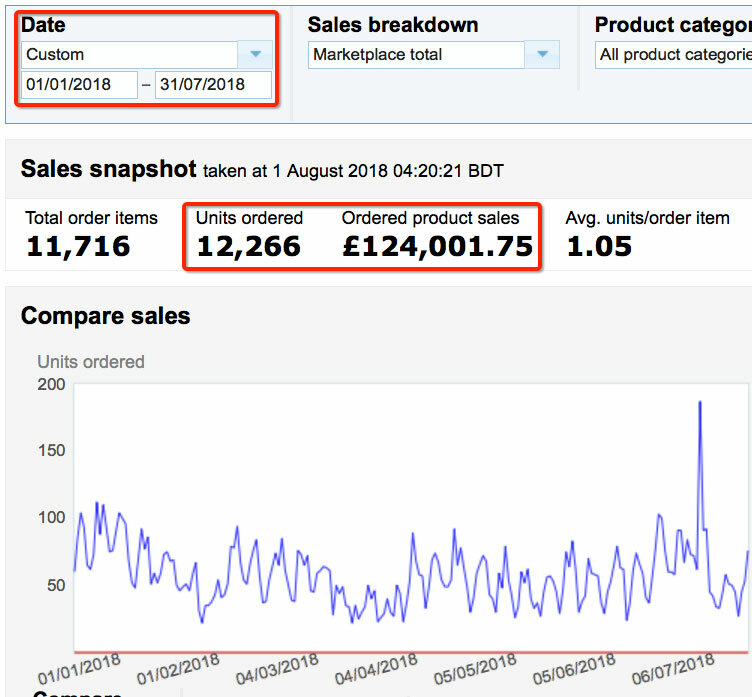 One aspect I think all sellers should be aware of is that when we look at a months revenue using “Sales Summary” this data can be extremely misleading. If you want to know what you actually bank for a calendar month then a date range report is the only way to go. I find my Net to often be several thousand pounds less than the figure quoted in my sales summary. This is because Amazon includes gift wrapping amongst other things in its sales total summary, which of course doesn’t end up in our pocket. Thanks Roger, I appreciate it. Yes, I know that these numbers are not spot on and 100% accurate but I use them to keep things simple and basically for illustration purposes for these posts. 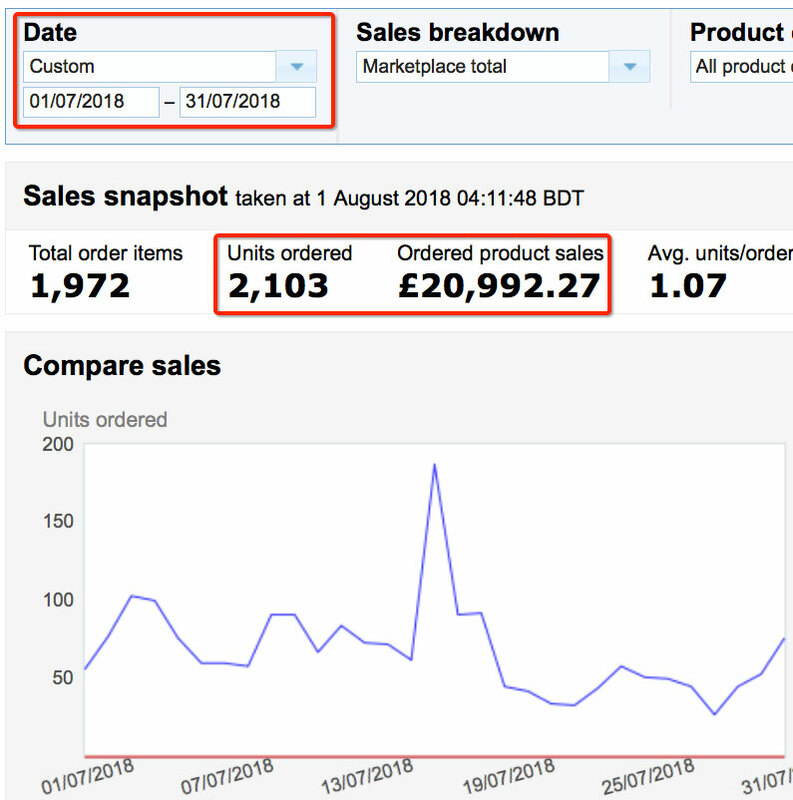 For my own, internal accounting purposes and business purposes in general I use date range reports to see how much money comes in, how much I spend on ads, fees etc. Did you use any Promotions for Prime Day? Your blog is amazing. I have read all your post from January regarding this Amazon journey. You are giving so much value to people that is truly remarkable. Also want to say thank you for including Slovakia in you VAT post, and basically answering my question. Eventually I did not register, even though I am from Slovakia, because I established an Ltd in the UK. Thank you for your work and looking forward for your new articles. I just wanted to express my gratitude for all the effort you put in to your blog and for the information you share for free. And I know 100% what you mean as I was in your shoes too, many moons ago and I was learning from other blogs, books, courses and forums (no YouTube back then) and all it played a CRUCIAL part in my overall success, not talking about the constant boost in motivation levels. Hi Andrew , congrats on your selling performance. But something is not adding up – you’re getting your profit from the sales and subtract your ads cost. But you have made £6488 in sales from ads – so as you were saying – you are not making an profit on that – even loosing some money. So should that be taken off your total profit? 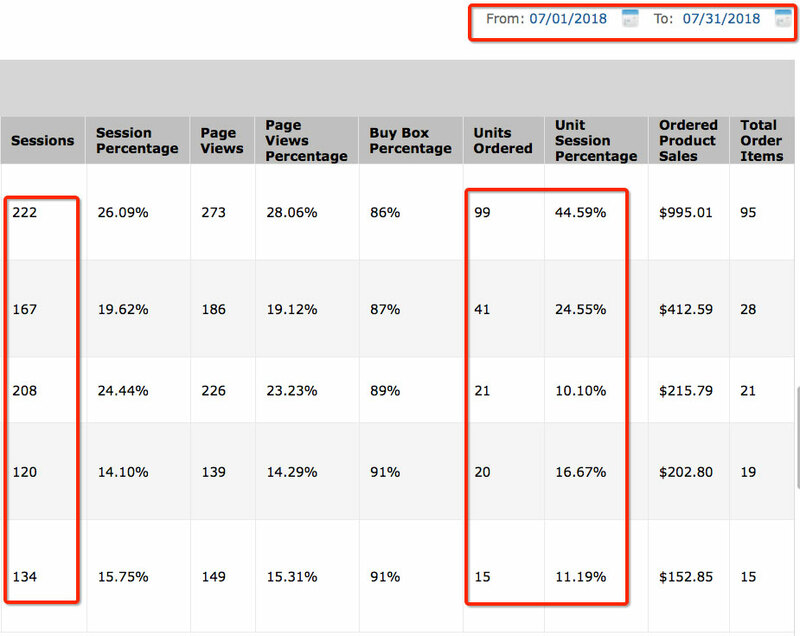 The Sales report (main sales report) already INCLUDES sales that come from Ads. So it’s already part of that report, I don’t have to use that sales number from Ads dashboard separately. And as you can see from my calculations, I am taking off ad cost of course to get my net profit.